At Urban Ladder, Ashish Goel says, integrity is non-negotiable. 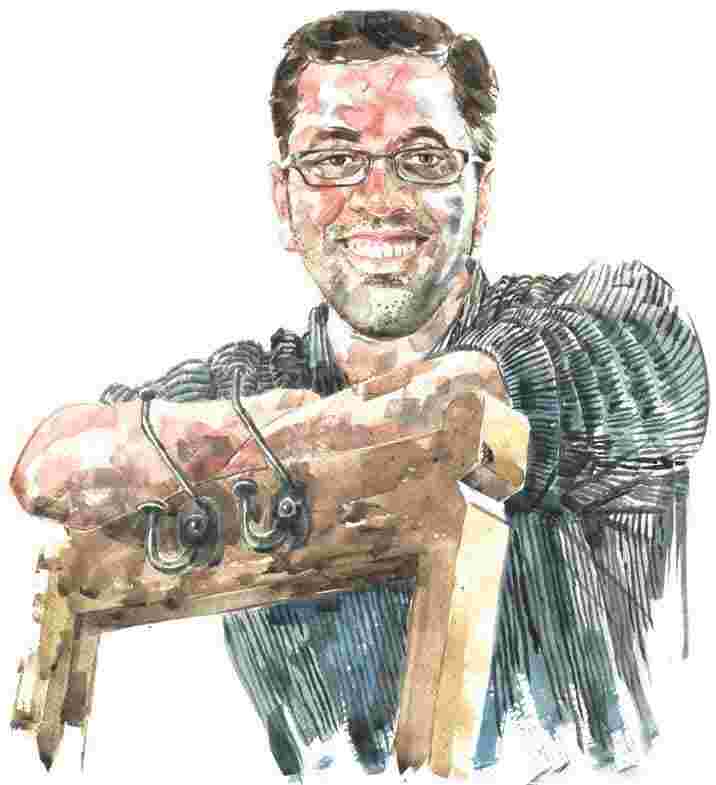 Ashish Goel, the 39-year-old CEO and co-founder of the Indian furniture brand Urban Ladder, has had an eclectic career trajectory. The Indian Institute of Technology, Bombay and Indian Institute of Management, Bangalore graduate may have started his work-life somewhat predictably as a strategic business consultant with McKinsey & Co., but his next stint was selling comic books and reviving the storied children’s content brand Amar Chitra Katha. His next venture saw him selling beds, sofas and dining tables—creating, with co-founder Rajiv Srivatsa, a company that ushered in an era of smart, affordable furniture with reliable customer service in India, and was reportedly valued at over ₹ 776 crore during its latest investment round earlier this year. We meet in Goel’s office at the Urban Ladder headquarters in Bengaluru’s Indiranagar-Domlur area—right above the first Urban Ladder offline store. Last year, Urban Ladder went into omni-channel retail, moving from an online-only model to a hybrid one; it currently operates nine stores across the country, with several more in the works. I am early for our 4pm appointment, so I spent the extra minutes browsing through the store, with its inviting nooks and corners, all decorated with Urban Ladder furnishings and lit by soft yellow light and mood lamps. Goel bounds out of his room on the third floor to meet me. He is most unlike anyone’s idea of a CEO—frank, accessible, irreverent and chatty. Our conversation feels more like a catch-up over coffee than an interview and often digresses into conversation about Goel’s childhood in the then-badlands of Ghaziabad, Uttar Pradesh (it comes out during our chat that one of his classmates was Vikas Yadav, who was convicted with his cousin Vishal in the Nitish Katara murder case). Goel starts by clarifying that he has been wrongly quoted in some interviews as saying he was planning to start a lingerie company before Urban Ladder. “Arrey it was laundry!" he says. “Some genius went and recorded laundry as lingerie! True story! Aur mere ko sab log poochh rahe hain (and everyone keeps asking me)… nothing wrong in selling lingerie but let’s set the record straight that it was laundry." Talking about Urban Ladder’s six-year journey and important landmarks for the company, Goel says he doesn’t “remember anything negative". “You know what people say about ‘forgive and forget’? In my case it’s more like ‘forget and then automatically forgive’. Any negative interaction—I genuinely don’t recall it after some time. It’s like kucch to panga hua tha iske saath, but yaad nahi aa raha (I recall there was some problem with this person but I don’t remember what). It’s a very powerful gift," he says, leaning back in his chair, laughing. Being a scatterbrain helps, he admits. “I surround myself with a lot of people who are very good at process management. To use a cricket analogy, there are pinch hitters, and there are people who rotate the strike and build the innings. I do everything in intense bursts and over time I have structured my life around that—I pick one challenge, do an intense burst, and then hand it to someone else to work with that. That’s how I can channelize my energy best," says Goel, calling himself “more a (Virender) Sehwag than a (Rahul) Dravid". Urban Ladder started life in 2012 as a 10-member team operating out of a house in Bengaluru’s Marathahalli area, and soon got $1 million (around ₹ 7 crore now) seed capital from Kalaari Capital. From the beginning, there was a strong emphasis on design and customer satisfaction. Its website was fresh and innovative and was quickly noticed in metros and tier 1 cities for its detailed specifications and common-sense touches like putting the size of the furniture in perspective by placing it next to a human figure. The company also followed the global practice of giving a unique name to all items of furniture—so its chests of drawers were named after famous explorers, a reclining sofa was named after Friends character Joey Tribbiani, and lamps after bright and sunny places around the world, lending the company a fun, youthful appeal. “Naming the products is great fun," says Goel. “We think a lot about these small things that no one probably cares about. We like to see beauty and joy in small things." The design aesthetic of the company was also distinct from the heavy, overwrought styles usually available at stand-alone furniture stores in India or the lightweight and aggressively utilitarian MDF-board furniture, a favourite in many middle-class Indian homes. The design aesthetic that the brand first came to be identified with can be called “contemporary with Indian touches"— produced in dark solid wood with accents of warm metal, distinctive handles, and use of traditional handcrafted techniques. Eventually, the company also started designing pieces in what it calls the “international modern" style— inspired by the evolution of design in early 20th century Europe with a Scandinavian influence with classic clean lines and contours. Building a team and defining the company culture was also a priority for Srivatsa and Goel. “Culture is not a soft point. No matter what kind of company you are running, culture is integral. It is the DNA of the company," says Goel. “The organization won’t be able to leverage talent to its fullest potential without a great culture fit and you have to remember in the first few years that the organization is not just living in the present time but will carry its DNA into the future." At Urban Ladder, Goel says, integrity is non-negotiable. “You have to be a decent human being. We also go by the spirit of the Indian Constitution—secularism, respect for diversity, respect for personal freedoms," he says. One reflection of this can be found in a recent “prayer" range of furniture called Devoto, which is secular in its design and can be used by people of all religions. Earlier this year, Urban Ladder raised $12 million from investors Kalaari Capital, SAIF Partners, Sequoia Capital and Steadview Capital. These funds, along with the $15 million raised in January 2017, are being used to set up more offline stores across the country, with the ultimate aim of taking the company to profitability over the next few years. “We very clearly want to break out of the funding cycle. We know that the best way to create return on investment is if the investment is less," says Goel. One of the reasons to open physical stores is to tap into the segment of buyers who want the touch-and-feel aspect of furniture-shopping: people who will look online but buy offline. He feels that the bulk of Indians are still in the phase of consumer economy where discretionary spending is not high and an “evolution of taste" is still happening. I bring up one of my pet peeves: why are Indian sofas so ugly? “Look at the architecture of our cities," says Goel. “Look at the clutter, the broken pavements. And look at, say, Europe—there’s beauty everywhere. So your eye is trained to see beauty and symmetry and appreciate them. In India, our exposure to it is still very low, there is a general lack of structure and design (in our public spaces). We have to be patient. We’ll get there," he adds. Which brings us to the IKEA question: How will the Swedish company’s entry into the Indian market impact Urban Ladder’s business? Are they worried? “If you look at any international brand’s entry into India, the category has seen a significant positive growth...whether it’s apparel, automobiles or any other industry. Actually, we are looking forward to the better organization of the market and competing with IKEA to build better stuff for customers. Also, we have the home-grown advantage for the last six years, with an extremely loyal and growing customer base," he says. Goel is a big reader—and not just of management books. “I love to read, particularly fantasy fiction, and at any given time my locker is stocked with 30-40 books. It is an important daily ritual for me, and I spend at least the hour before bedtime reading. It helps me disconnect and collect my thoughts, and get mentally re-energized for the next day," he says. His all-time favourite book, he says, is Science: A History by John Gribbin. “Bill Bryson’s At Home: A Short History Of Private Life, which describes the history of the modern home, is a favourite because of its relevance to my work and not-so-secret passion." Playing badminton and running are also important to Goel and he usually manages to make time for at least one every day, with longer sessions on the weekends. He has taken to cooking recently, and says he spends at least part of the weekend trying to recreate favourite recipes. Goel is also a new cat daddy, and says she keeps him on his toes. “Being a cat dad has taught me a lot about the kind of parent I am going to be," he says.